We were all lined up in the hallway, leaning against the wall. The closer I got to the door, I’d stretch out to look around my friends and look inside. My turn was getting closer and closer. When the teacher put her hand on my shoulder for my turn, I couldn’t move. I refused to go inside the dark classroom. The teacher told my mom about it and I thought for sure I was going to get in trouble. 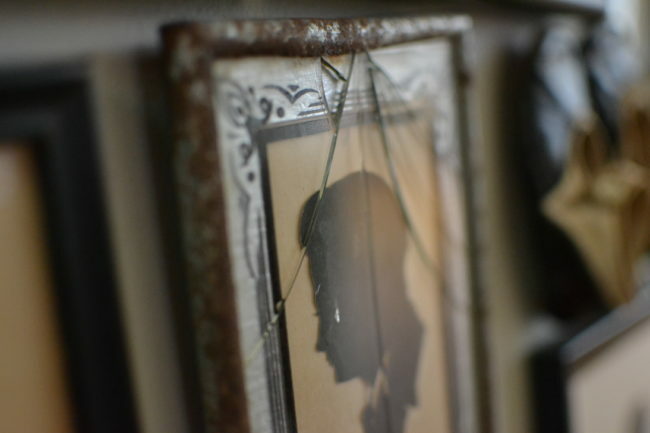 But, no, mom explained that they were just making a silhouette of my head, just like we would trace each other’s hands on paper, but of my head and NO she wouldn’t make it instead. 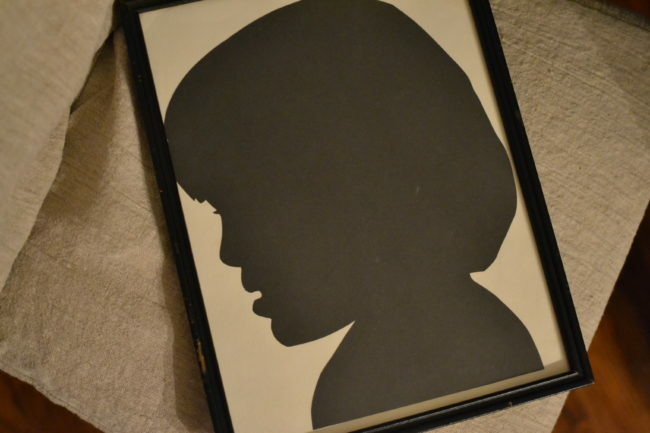 The next day at kindergarten, I had my silhouette made. I guess you can stay it was the first silhouette in my collection. 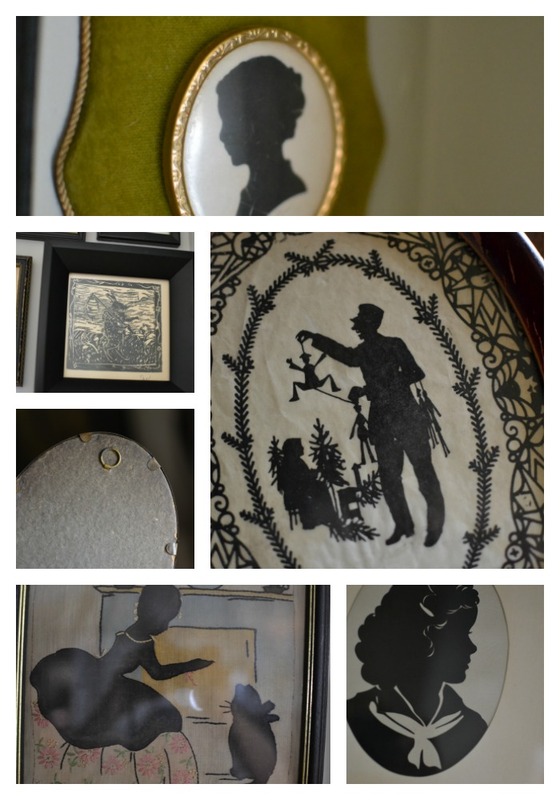 Can you guess where the word Silhouette came from? You would think it would be from the first famous silhouette artist…..
From Wikipedia: The word silhouette is derived from the name of Étienne de Silhouette, a French finance minister who, in 1759, was forced by France’s credit crisis during the Seven Years’ War to impose severe economic demands upon the French people, particularly the wealthy. 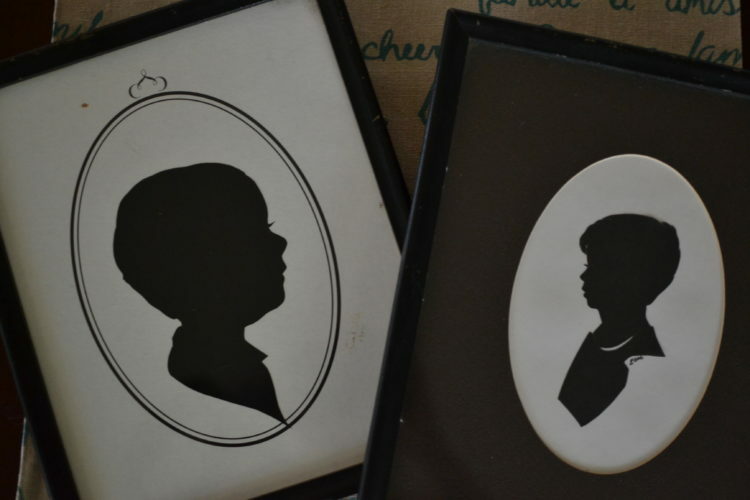 Because of de Silhouette’s austere economies, his name became synonymous with anything done or made cheaply and so with these outline portraits. 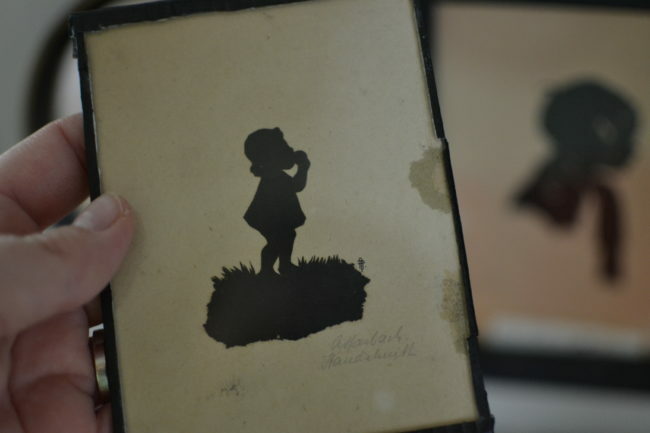 Prior to the advent of photography, silhouette profiles cut from black card were the cheapest way of recording a person’s appearance. 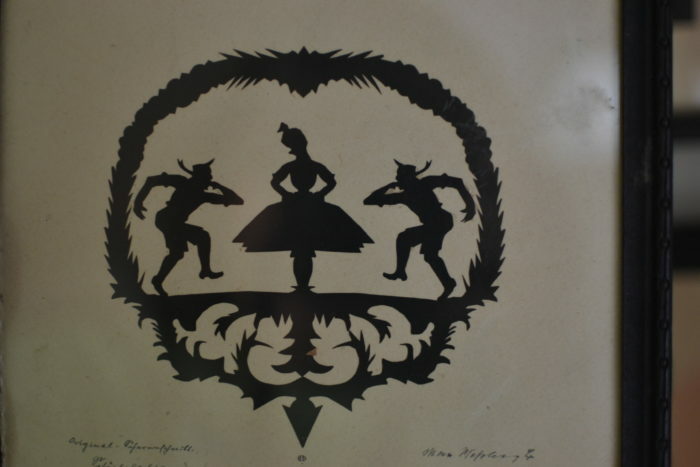 The term silhouette, although existing from the 18th century, was not applied to the art of portrait-making until the 19th century. 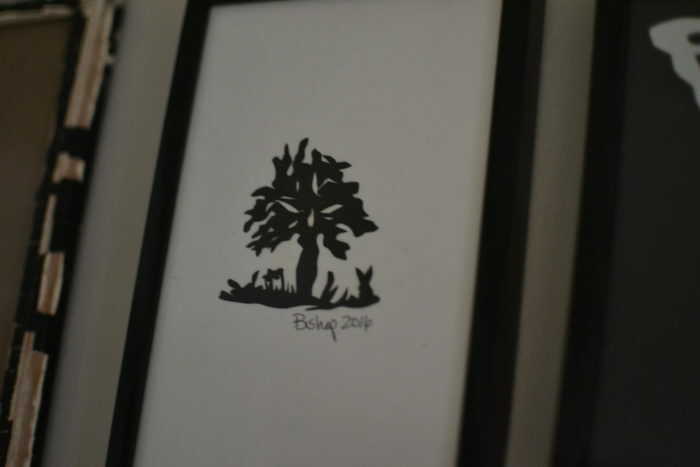 I recently finished up a year-long project filling a wall up with these silhouettes and posted a picture on Facebook and Instagram. I was really blown away by all the comments, likes and questions about my collection. So I thought I would share a bit about them…. 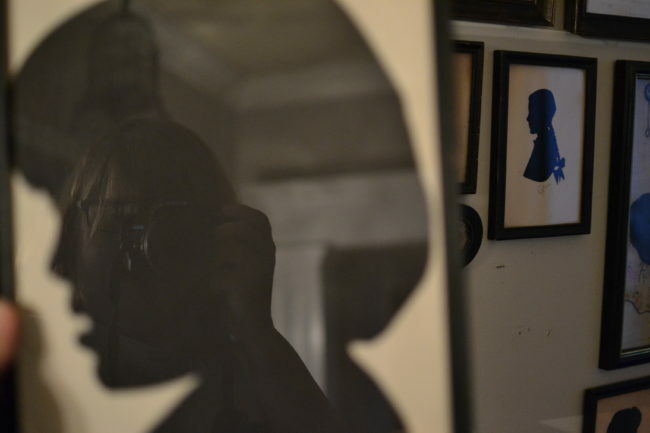 My second silhouette was of Drew. He was a toddler. Mom and I were at a craft fair and I was pushing Drew around in a stroller. 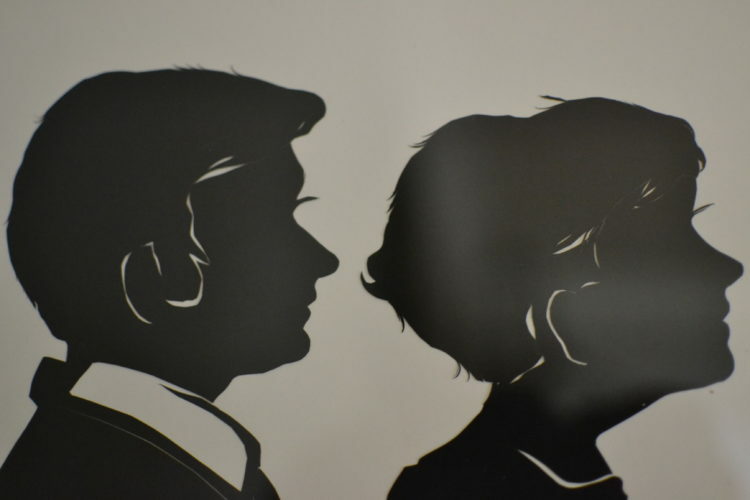 There was an artist who cut out his silhouette just looking at him. I remember thinking WOW. I took Chad to the same craft fair when he came along, but the man wasn’t there. Several years later we went to Rock City in Chattanooga and there was a lady sitting on one of the paths cutting silhouettes. Chad wasn’t too thrilled about standing still while she cut out his likeness. But I was so happy to finally have one of him too. The three of us have hung on our bedroom wall ever since. But that’s just family….not really a collection per se. I purchased these two at an auction about 18 years ago and they officially started the collection. The next a Christmas puppeteer purchased in Dresden Germany. 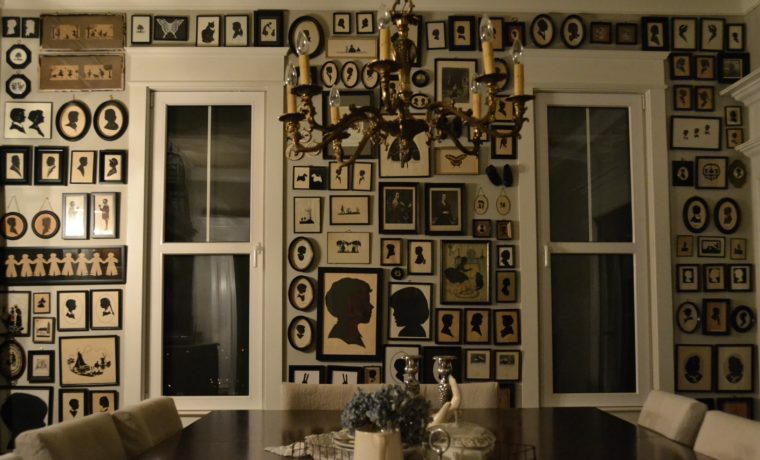 When we moved into this house, I pulled together the silhouettes and hung in the dining room. It grew over the years but in January, I repainted the dining room and decided I loved the collection so much I would move it to the other wall so I could see it from the kitchen. From here it grew to fill the wall between the windows with plans to fill the entire wall. They are hard to find at a good price. 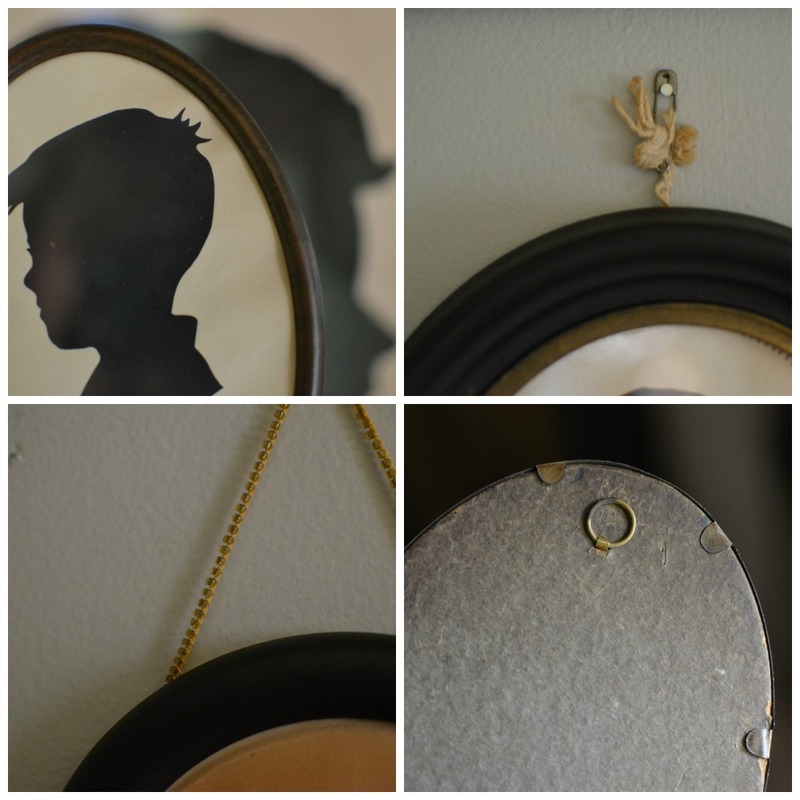 I looked for them at estate sales, vintage markets, ebay and etsy. Many available are just more of the same. I tried not to spend too much. But a few I broke the rule because they were just so unique. I purchased this one on eBay from England. And it got me thinking…. I emailed my friend Annie and asked her if she would look for me some silhouettes there in England and ship them to me. She sells on eBay and I knew she went to flea markets and such. She took this quest on personally and found me some really great silhouettes. They are some of my favorites. (And extra special because Annie found them.) She drove to a neighboring village to retrieve these. I worked on getting some loose ones framed. 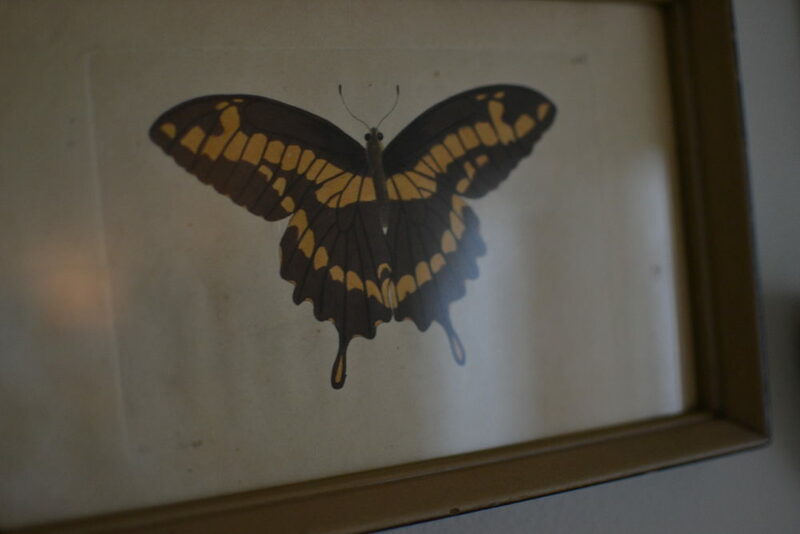 I found that buying old frames with ugly pictures in them was much cheaper than a new frame and had the look I wanted. I also painted a few. 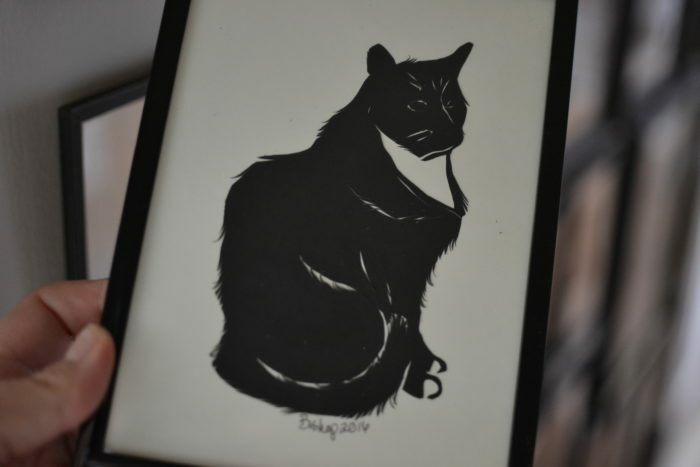 I did end up having to get a few framed that were odd sizes and using a few plain black frames from Hobby Lobby. A few months back, I called David, a friend from church whose mom was a silhouette artist to ask if she could cut me a picture or two. 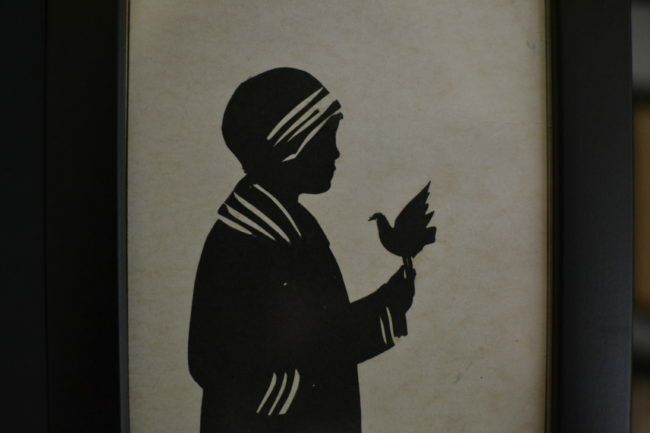 Sadly she had passed away but his sister, Rita, was in town from Alaska and she is a cutter and would be willing to make me a few silhouettes. 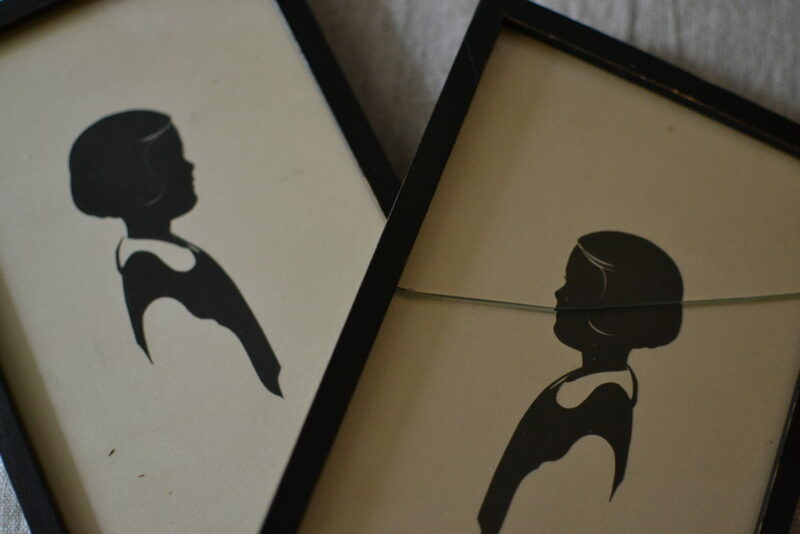 They invited me over and I poured through their books of silhouettes from their mother’s work. I peeked over Rita’s shoulder as she begin cutting a silhouette of my parents from a photo I had brought. She was amazing to watch! The white cut outs in the middle she called slashing. Incredible. She cut out a picture of Annie. And with the left over paper, cut this. 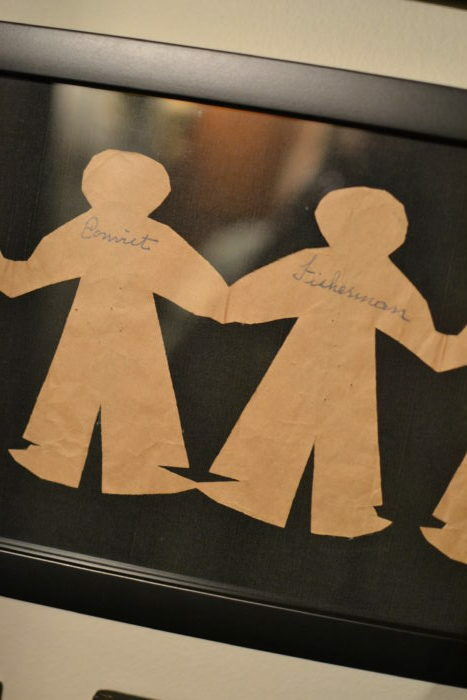 Her mom being a silhouette artist would travel to area malls to cut pictures, especially around mother’s day and Christmas. She would take Rita along and Rita would cut silhouettes for the customers waiting in line for her mom to cut. She learned fast this way and eventually started doing them along with her mom. She was 12. They would go to malls and set up and sell them for $1 or so. She gave me some that her mother had done and a few from a fellow artist who she admired and who had encouraged her. This was a very special afternoon. 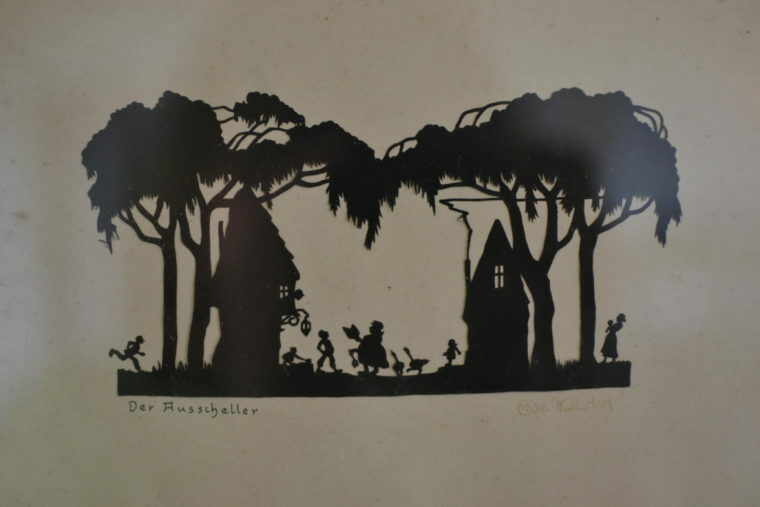 Although many silhouettes are not signed or I do not know about the artist, I did read about an artist who I noticed I had several made by her. Wallie Spatz. She began as a young girl too and became well-known back at the start of WWII. 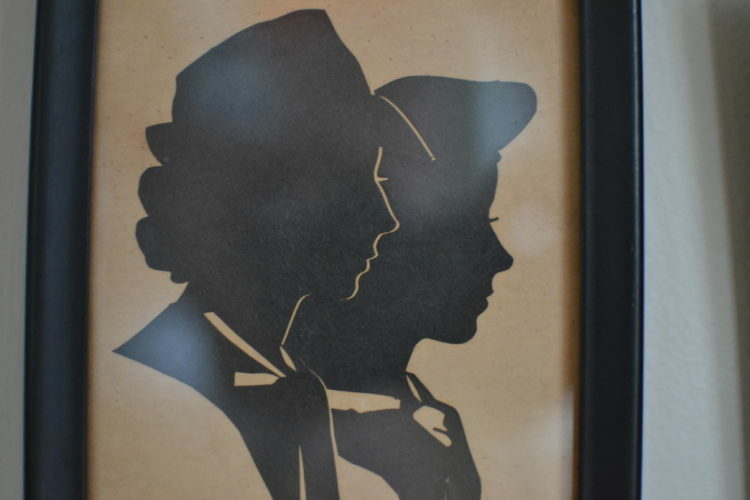 She cut silhouettes out for servicemen before they went to war, giving them a picture to leave with their loved ones. Most of hers are in oval frames. 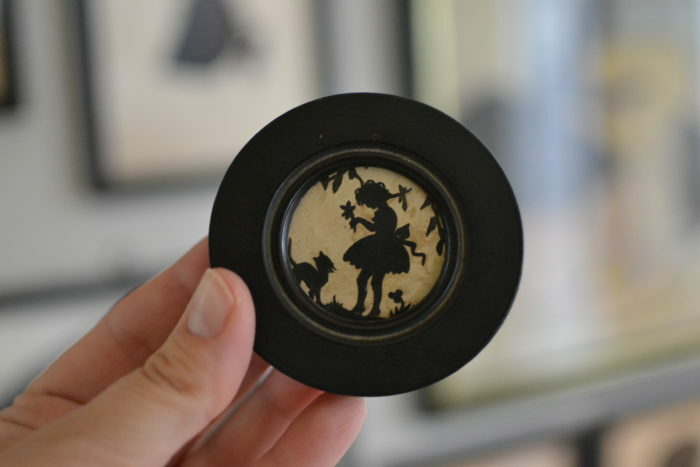 I have some from World Fair’s and several “Scissorettes” made at Fairs from an artist who lived in Hollywood in the 1920’s and coined this term “Scissorettes”. His were always full body and included something additional, such a bird or toy. He has an exhibit in a museum in Albania. I do adore her with the bird! It’s hard to narrow down a favorite. 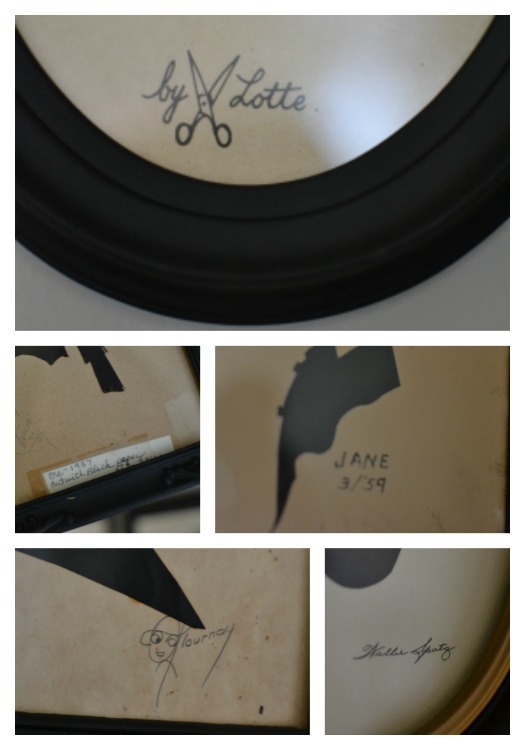 I like many of the for different reasons; the hand written names, the unique signature, the story of how I acquired it, the way it hangs or the subject. 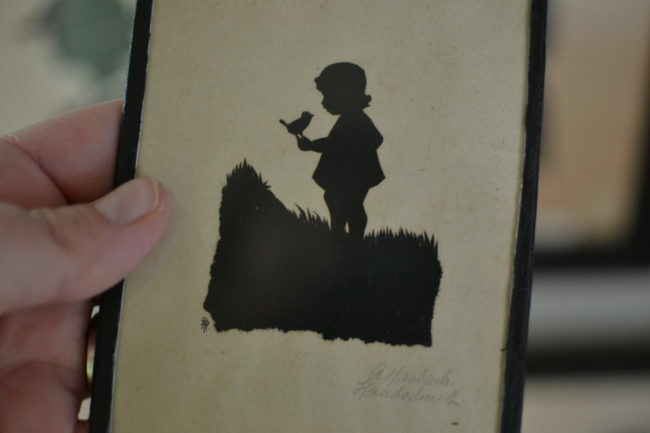 But my very favorite is the little girl holding the bird that Annie found in England. 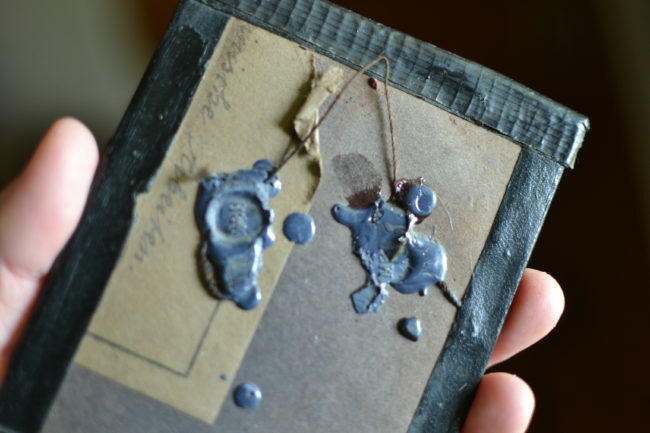 The sweet size and subject, the simple frame made of a material around the edges and the wax drippings holding the hanging string. It’s so dear. Silhouettes it seems, have never gone out of favor. Which is a good thing. Something to treasure and collect and enjoy. Thank you for your interest in my collection. I can’t say that I’m officially done, as I’m sure I’ll come across one here or there that I simply must have and trade it out. But for now, I’m good with the results and I am happy to share it with you. PS My favorite photo I took. 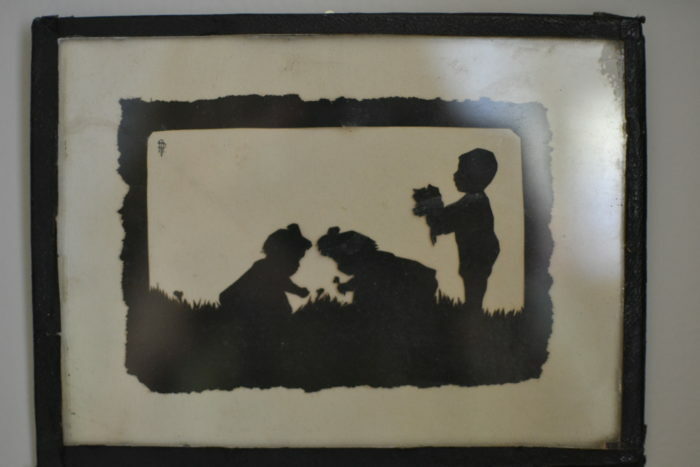 This entry was posted in etsy, vintage and tagged artist, collection, cutting, ebay, etsy, paper, silhouette, silhouettes by Katey. Bookmark the permalink. This is beautiful! Beautiful words and silouhetts! I hate being sooo terribly jealous! 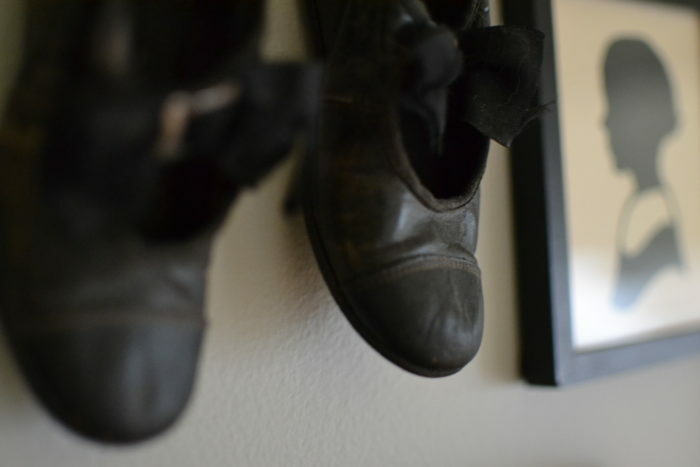 Have always been fascinated with them and what a beautiful collection you have! Thank you for sharing! Would love to stand in front of them and admire each. Love you bundles! May our Lord bless your kind heart! I missed your blog but I now have a new ISP so I hope my name is now back on the list. i did request it just now.